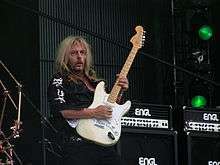 Axel Rudi Pell (born 27 June 1960) is a German heavy metal guitar player and his eponymous band. He started off with the band Steeler (1984–88) before leaving to start his solo career in 1989. During this time, he has played with such drummers as Jörg Michael and Mike Terrana, and singers Johnny Gioeli, Jeff Scott Soto, and Rob Rock. SPV Records released a live DVD on 25 February 2008, titled Live over Europe, which includes the full performance from the Rock Hard Festival in 2007, and comes with a bonus disc which includes live footage from Pell's own archive. ↑ Axel Rudi Pell Announces Live Over Europe DVD Archived 7 February 2008 at the Wayback Machine. Wikimedia Commons has media related to Axel Rudi Pell.